""Mayor of the Village" Steve C. Nelson shows off an extremely rare earthenware jug made for the July 24 celebration in 1899 for Hotel Roberts at the Pioneer Village in Provo, Friday afternoon. The earthenware jug was sold for two-thousand dollars and is leaving Utah Valley for the first time." Last week I was sent to take a picture of a jug. Yeah…a jug. It was an extremely rare earthenware jug made for the July 24 celebration in 1899 for Hotel Roberts. Well, the jug was sold for two-thousand dollars and is leaving Utah Valley for the first time. 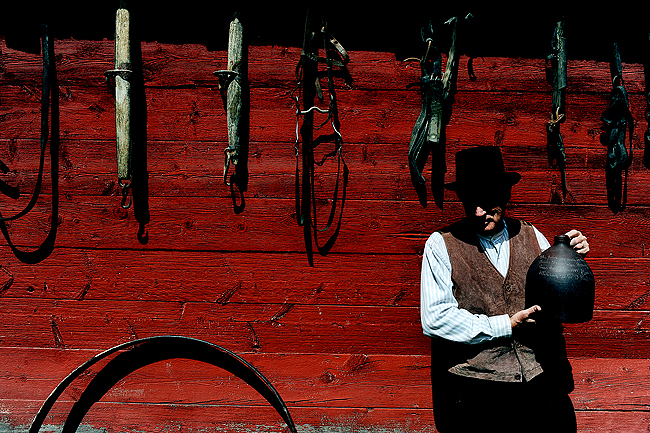 Luckily, this dude was there at the Pioneer Village to pose with it. I shot some really lame, boring stuff, but when I was leaving I noticed the red barn. I knew with the light I could make it more about this jug, less about the dude and more graphic. So I made him un-box the jug and pose one more time. Shooting for another two minutes didn't seem to mind him, and I am glad I shot the assignment twice in the 10 minutes I was there. 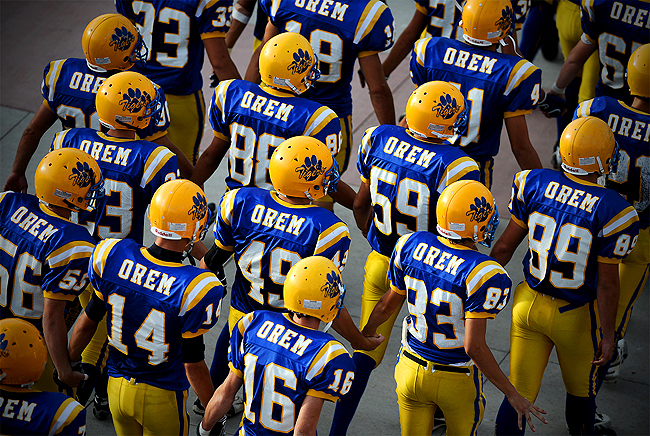 "Orem takes the field against Payson before the game at Orem High School, Friday, Aug.28, 2009. Orem lost, 20-13." Well, all my “good” story telling photos went to waste during Friday night lights when Orem ended up losing. I could hear the Payson fans erupt as they went ahead, 20-13, in the fourth quarter. Where was I? Trying to make deadline from my car. That’s life when you got a paper to put to bed, right? This is one frame I liked from the top of the press box before the game. I thought it was funny, I mean, this is Provo, right? 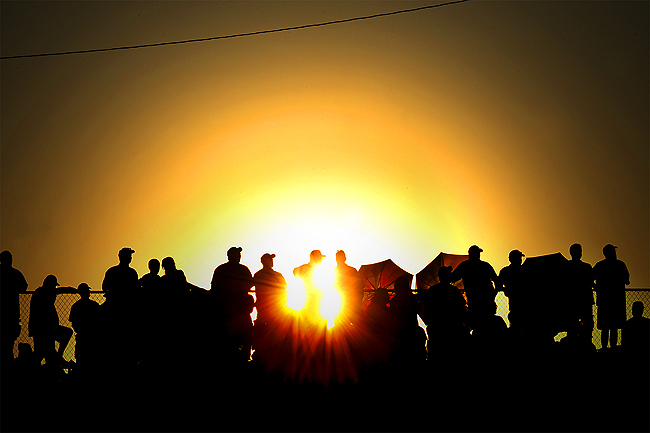 "As the sunsets, Pleasant Grove fans cheer against Timpview at Timpview High School, Friday night." What can I say, the sunsets are so rich, golden and beautiful here. I find myself shooting into he sun as much as possible. However, at games like these, once the sun falls behind the mountains, it feels like someone cranked the air conditioner to 63 degrees. No, I am not complaining, it actually feels like heaven. "Jamison King, 15, sophomore at Lone Peak High School, is doused by a bucket of water during the Sophomore Splash at Lone Peak High School, Tuesday, Aug. 18, 2009. New students were welcomed by meeting other peers as they participated in activities, such as: water balloon fights, kickball, slip-n-slide, and a dunk tank." I love water. I love water especially when it's hot. I really love water when I get to photograph anything related to it. Every year Lone Peak High School in Utah features a fun back-to-school event called Sophomore Splash. New students were welcomed by meeting other peers as they participated in activities, such as: water balloon fights, kickball, slip-n-slide, and a dunk tank. Needless to say, I came prepared with plastic bags for the cameras. But once they got started with their antics, I thought I could get away without getting too wet. Sure, I was catching some over spray from water balloons, slides, but nothing extreme. Well, I thought I was safe until I felt something sting my back. Yep. One of the kids decided to pelt the photographer in the back. I was drenched. At first I was really pissed, I was dressed decently and had other assignments afterward. But I realized that as long as the camera stayed dry, I was happy. After that, I continued to get wet and glad I did. I had a lot more fun that way. 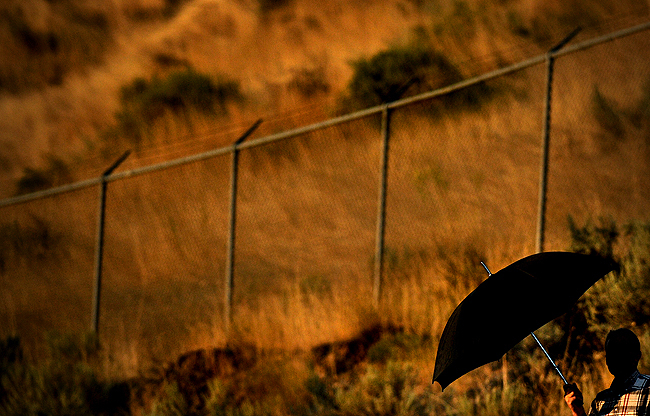 "A Timpview fan shades himself from the sun against during a football game at Timpview High School, Friday evening." Anyone who knows me knows I am overly obsessed with umbrella photos. Sure, they are cliche and overly done, but I think that's one of the things I like about them. It's always a challenge to make a new frame with one. Anyways, I've noticed that while it's "hot" out here (obviously they've never been on the East coast with all the humidity), that the sun is pretty intense. So a lot of people have umbrellas during perfectly sunny days. This guy caught my eye during a timeout of the Friday night season opener for high school football season. "Children from Spring Creek Elementary wait to depart school on Provo School District bus No.34, Friday afternoon. Bus routes are getting cut, but some hazardous routes still remain. In addition, the Provo School District will no longer bus children who live less than two miles from school." What can I say, I knew something was up when I saw "Reading Rainbow" on TV before leaving for work. My editor let me know before my shift that I'd be riding on an elementary school bus during the after school drive home. I was really eager to get on the big yellow vehicle since I hadn't rode on a school bus as a student for at least a decade. After sitting, chatting with the driver for 30 minutes waiting for the children to get out of school, it happened. The loud, wild, overly energetic kids were ready to go home after a long week of school. I had a BLAST! But you don't have to take my word for it. OK, well, maybe you do, or you can just look at my pictures above. Between "Reading Rainbow" and riding on a school bus, it had me feeling totally nostalgic all day long. Assignments like these almost let me relive past experiences, such as a being child in grade school. These assignments totally make this job unlike any other. I love it. "Pleasant Grove's Jeff Harris (No.26) rocks Timpview quarterback Trevor Brown (No.12) during the first quarter at Timpview High School, Friday, Aug. 21, 2009. Pleasant Grove won, 16-10, ending Timpview's 36-game win streak." I was really, really rusty being my first football game of the season. Not to mention, the pressure was on. Pleasant Grove was hoping to end Timpview's 36-game win streak and dethrone the multiple repeat reigning 4A state champs. Now, I'll admit, I didn't know much about either team, but assumed if Timpview had a three year winning streak, they wouldn't be beat. Well, I did know a little. One thing learned was that these were two of the state's top programs, and it would be exhilarating to the end. 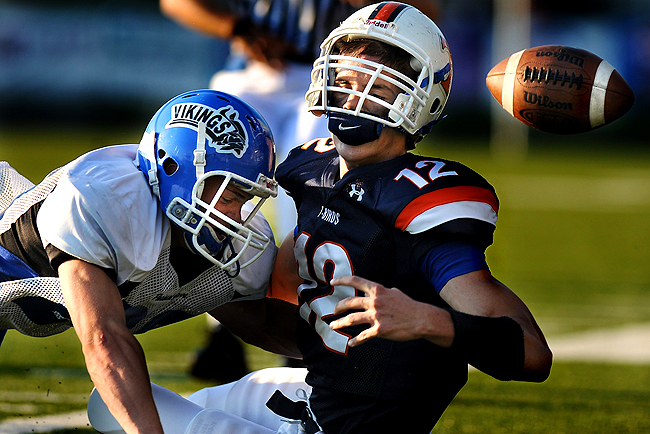 Last year it came down to the last play of the game, but Timpview still came out on top. This year, the game was close again, a sea-saw, back-and-forth battle. But this time, unlike last years thriller, Pleasant Grove came out on top, 16-10, ending Timpview's state record 36-game win streak. It literally came down to the last play of the game where Timpview's quarter back danced around in the backfield before being sacked. That's what great football games about about though: One team making one last big play. Yet another big upset early in the Utah County sports season. Got to love it. 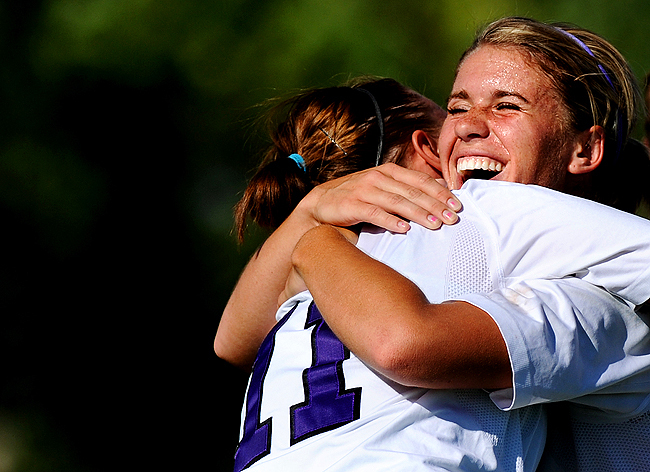 "Lehi forward Jessica Vanderhoef celebrates her first goal of the game with teammate Tasha Price with 12 minutes remaining in the second half against Orem at Lehi High School, Thursday, Aug. 20, 2009. Vanderhoef's goal led Lehi to a, 2-0, victory." I've only been here for a week, but have already witnessed two upsets very early in the Utah County sports season. The first being the Lehi upset over Orem, the reigning Class 4A girls soccer champions. What made this assignment a little different was that I was shooting Canon over Nikon for an extended period of time...for the first time. Work supplies me with a full bag of Canon goodies. But coming from freelance, I had a overflowing trunk of Nikon gear. Not to mention, I've been loyal to Nikon since I began shooting a couple years ago. Overall, I shot 200 some total frames at the game. About 150 were with a Canon 1D Mark II N and a 400mm. Before I continue, coming from full-frame the 1.3x crop is totally awesome with a 400mm. Anyways, I also shot 50 frames with the Nikon D3 and 300mm. Needless to say, I am still not used to Canon. I moved two photos. The above and this photo, both shot with the Nikon. Soon enough I'll get the hang of it, in the meantime, I'll continue to make better images with the Nikon gear. Or so I think. 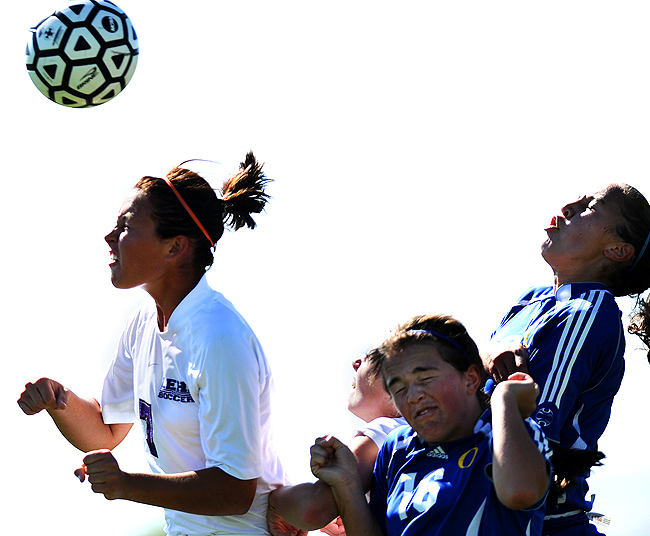 On a another note, I'll admit, I hate this photo, but I totally wanted to see this happen at the game at Lehi. 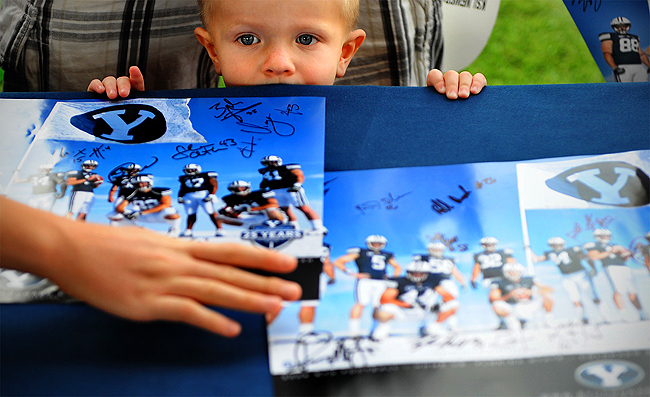 "Two-year-old Aleck Graves of Springville, Ut., peers over a table as BYU football players spring autographs during the Cougar Kickoff on Haws Field at BYU, Tuesday, Aug. 18, 2009. During the event, fans were not only able to get autographs, and meet the players and coaches from the football team, but other BYU athletic teams, too." I heard BYU football was huge, but not nearly as big and popular as I expected. Early this week I had to shoot the Cougar Kickoff, which is basically a meet and greet for fans. Open to the public, folks can meet players, get autographs, participate in games, and even scoop up leftover shoes, bags and jerseys for discounted prices. It was unlike anything at my alma mater. My college couldn't even fill a quarter of the stadium, but they sure did like to spend money trying to make it seem better. BYU is more like University of Maryland College Park back home. They continue to produce NFL worthy players, and since Provo is such a small town, it seems like BYU football games are the place to be on a Saturday afternoon. One fan I was talking to said the games sell out well in advance of the season. Luckily for me, I won't have to fight for a ticket since I'll probably be shooting a good amount of the games. Anyways, for as exciting as BY football is, this event wasn't very visual. So I did my best to find children that were star-struck when they got to meet the players. In this case, I liked this little guy. I thought it was fitting for the story to, almost like getting a peek at the team before the season. This was also my first A1 for the Daily Herald. 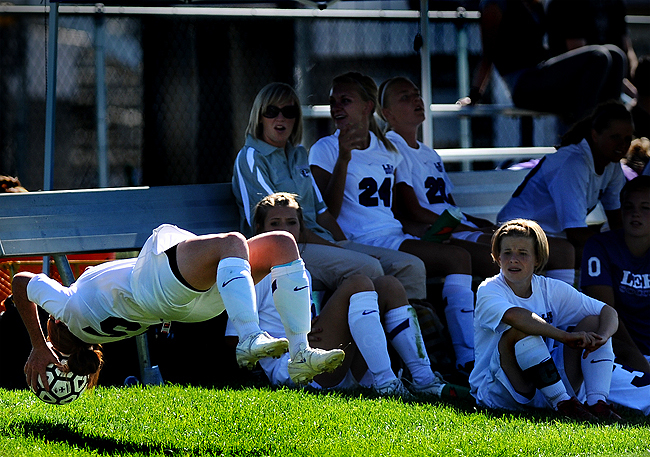 "Springville's Sarah Duncan (No.19) face plants after being tripped against Timpanogos during the first half at Springville High School, Wednesday, Aug. 19, 2009. Springville led, 1-0, at half." 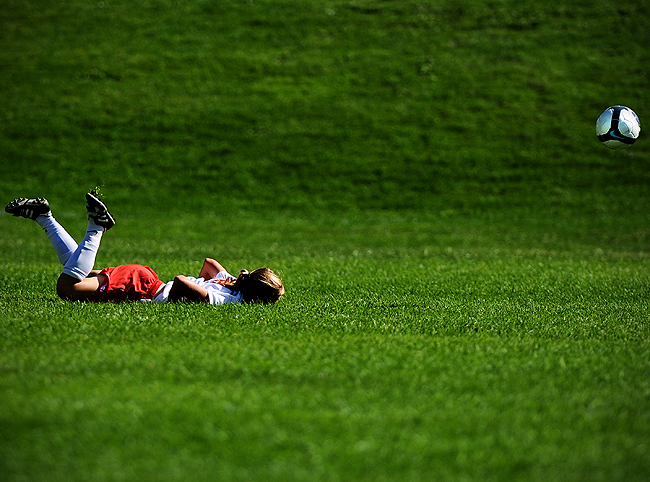 Oddly enough, I didn't shoot one soccer game last year. When I was in college, I felt as if I was shooting multiple games a week, men and womens. In addition, since I played it in high school, I enjoyed shooting it every time. So to say I missed it last year would be understatement. I was totally bummed I didn't get to pick up even one game. This was my first game since probably Fall 2007. It wasn't anything spectacular, but I had fun. With that, I shot a lot of great assignments my first week, so look for an overload of back to back postings this weekend and early next week. 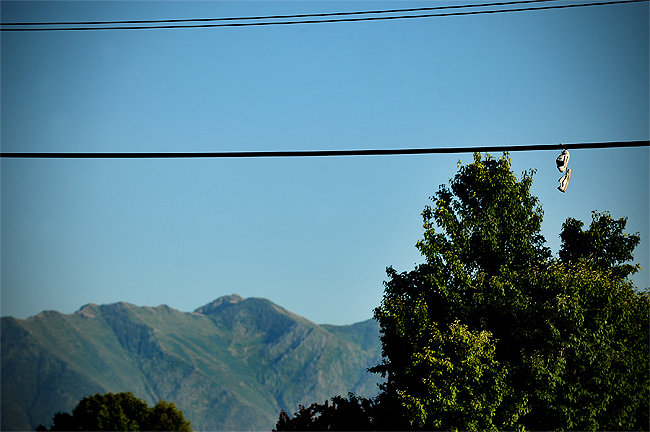 "A pair of shoes dangle from power lines on University Ave. in Provo, Utah, Wednesday, Aug.19, 2009." There isn't a place I don't not feel safe in Utah...yet. Coming from Baltimore, seeing the crime, reading about the homicides daily, witnessing the city first hand, it has been a totally different world crime wise out west. On my way home, literally two minutes from the office, I saw these shoes hanging from the power lines. I couldn't help but to laugh out loud. I immediately pulled over for a quick snap. I saw these a lot in west Baltimore. While I don't know the exact significance, I've read that it's to indicate everything from where drugs are sold and gang turf. So to see these in Provo was ironic. I think they average maybe one murder a year, in comparison hundreds a year in Baltimore. Good ol' Provo, what will you do next to make me smile? 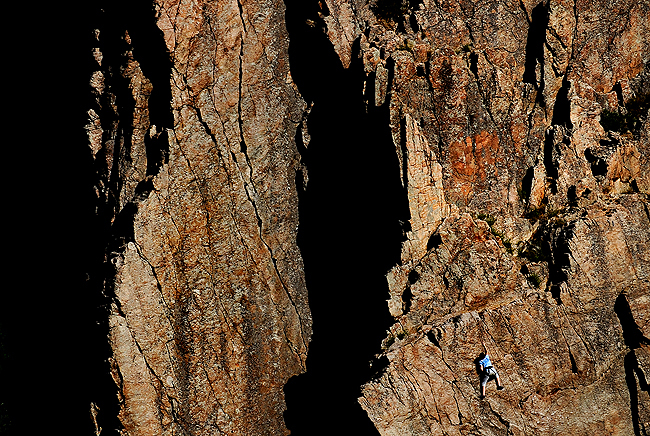 "Leta Shepherd of Provo climbs Tinker Toys Slab by top roping in Rock Canyon Park, Aug. 17, 2009. Only climbing for four years, she got into climbing after meeting her husband, Nate." I knew it was coming. No, I am not talking about my first day. I am talking about feature hunting on my first day. 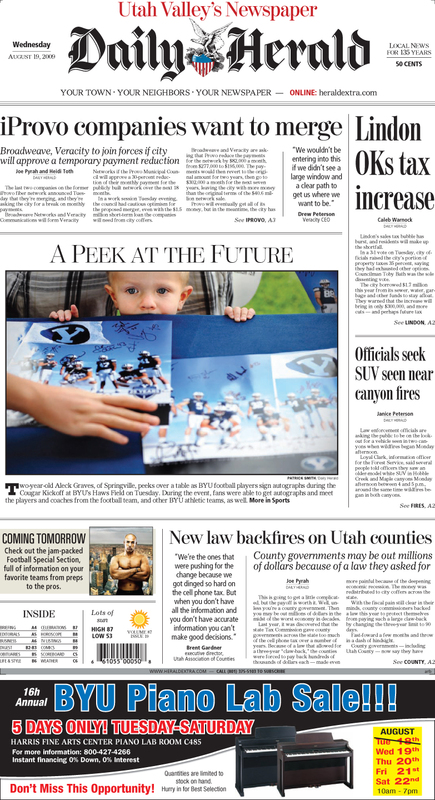 My first day at the Provo Daily Herald was on Monday. I was informed it would a be light day: paper work, introductions and getting used to their ways of filing and such. It was just that, and I was OK with it. While I did want to jump right into shooting, another part of me wanted to get acquainted with everything new. But in the back of mind, I knew that I really couldn't just sit there. Yeah. I was asked if I wanted to go feature hunting. In my opinion, feature hunting is great. Lots of options, freedom. Back home, it was easy knowing where everything was. The people, the events, the parks, etc. However, being somewhere new, I was terrified. I knew where nothing was. But a small part of me thought, "Well, then it should be simple if everything is new and exciting." Luckily, my editor told me to check out a certain park in the canyon where people rock climb. To make a long story short, I found two young, college guys who were going climbing. I followed them up, talking, jotting down some quotes and just getting a feel for what they do. After almost passing out from the 45 degree, steep grade hike, I started shooting. But off in a distance, I spotted Leta Shepherd (above). I won't lie, her hanging on the side of a rock face was a way better angle and picture than the two guys. So I hiked back down, walked a half mile up the trail and then hiked up the other side of the canyon to get her info and chat. It was exhausting and I had to explain to her I wasn't used to the elevation as I almost blacked out and tumbled down the mountain. Alas, although it was only for a climb stand alone, it was a great little adventure. I cannot wait to see what big (and other little) adventures I get into at my new home. "Making their entrance dives, Wynnewood's Dominic Klemm, right, and Navy Juniors' Kyle Leming compete in the Boys 8 and under 25 SC Meter Butterfly during a swim meet at Wynnewood Swim Club, Saturday morning." If I would have known this was going to be my last freelance assignment in Baltimore before taking the job in Utah, I think I would have gotten in the pool. Being my first swim meet to ever cover, I was pumped. I love getting to shoot something for the first time, no matter what it is. Whether it's completely new, or something old, yet in a new place. Nothing gets me going like a fresh challenge. I got up early and gathered my stuff, including my Canon G9. I've had this kick for underwater photography ever since breaking my G9 back out recently. Being a near perfect weather day, I thought of wearing my bathing suit and getting in the pool, but I figured that would only complicate things. Swimming kind of reminded me of wrestling. It's non-stop, and if you blink, you can lose track of everything quickly. While I was lucky to have the heat sheet (and some tips on how to track who and what I was shooting from friends beforehand), I still found myself asking parents every two seconds which race we were on. Although I had a blast, and enjoyed hearing people say, "Oh, my! That photographer just put his camera in the pool!" And having kids say, "Hey, Mr. You should put that (pointing to my D3 w/300mm f/2.8) camera in the pool!" I thought things could have gone better. Not to mention, I had been offered the Utah job that morning. Maybe I wasn't focused because I was thinking about a life changing move to Utah. And I am sure that's how I dropped my 24-70 f/2.8, too. Being clumsy with 100 different things on my mind. (The lens is now fixed!). Whatever the case. I am glad I ended with this assignment in Baltimore. Sure, in my mind I could have done better and focused. But I'll miss the water being land locked in Utah and this will be a reminder of home. Today is my first day as a staffer at the Provo Daily Herald. Wish me luck! 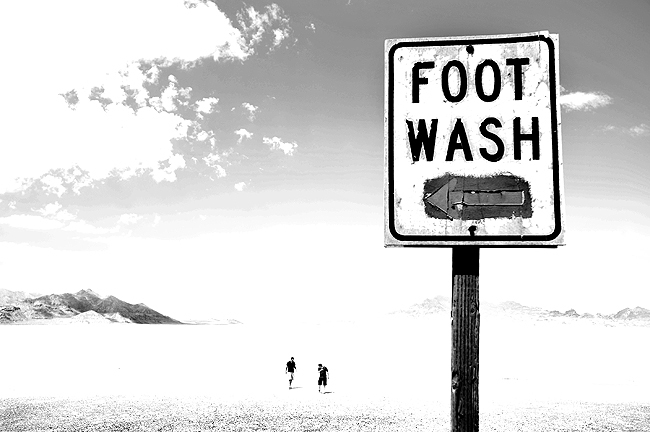 "Visitors tread across the famous Bonneville Salt Flats at a rest stop along Interstate 80 in northwestern Utah, Friday, Aug.14, 2009. 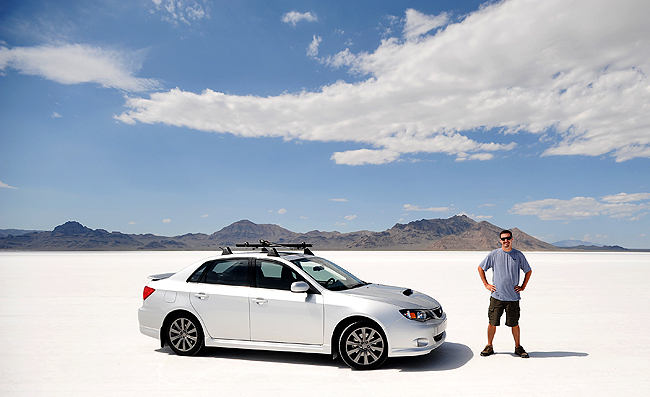 The salt flats are famous for their use as the Bonneville Speedway for high-speed race cars." On Friday, I ventured out almost two hours northwest to the Bonneville Salt Flats. I had heard about them and seen some video, but thought there was only one way to experience them: On my own. The day cost me a small fortune though. After filling my gas tank and buying a large bottle of water, we ventured west. Less than two hours later, we arrived. We took a small walk on the flats, shot some photos and then talked to a dude from California who had a cat and dog that were walking around the rest stop, but came back on command. Funny stuff. Or as he said, "bitchin'!" He hinted to us that the World of Speed may still be going on, and told us how to get there. Unfortunately, there was no racing going on, aside my from my own. Yep, I decided to take my new Subaru WRX out on the flats for a little fun. I will say, driving on it is an experience. I felt nauseated because I didn't really feel as if I was moving at all. Haha. But my new Subaru WRX sure did have some fun. Following that, we figured since we were four miles from Nevada, to cross over and gamble. Bad idea. I got greedy and after going up, ended up in the hole about $20. So as the day continued, and my debt increased, (a car wash to rinse the salt of my car, another tank of gas, and dinner) I decided it was time to turn in for the night and call it quits before I was broke. All in all, it was totally worth the trip and know I'll be back out there again soon. 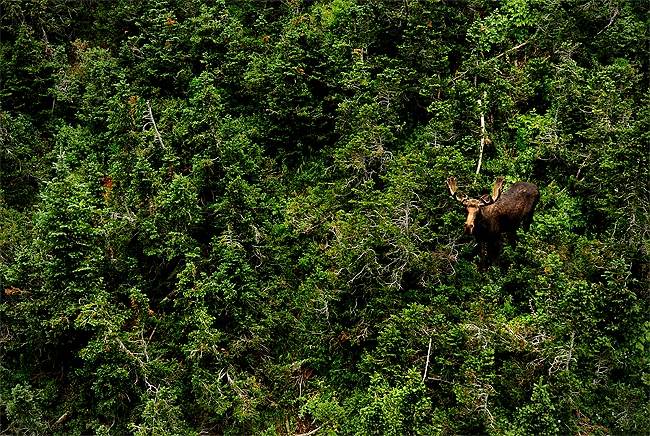 "A moose grazes in the brush along the Peruvian Express lift at Snowbird Ski and Summer Resort in Little Cottonwood Canyon, Ut., Thursday, Aug.13, 2009." Now that my new pad is setup with furniture, a bed (thanks, Mom), a stocked fridge and a TV (thanks, Dad), I finally got to venture out before starting work on Monday. On Thursday, I drove through Little Cottonwood Canyon, which is roughly ten minutes from home, to Snowbird Ski and Summer Resort. Obviously, there is no snow. So I took a short tram ride to the top, hiked for a bit and then took a chair lift down. Before heading down, I was stopped by a woman who liked my accent, but didn't know where it was from. "Baltimore," I said. She was excited when I mentioned that, knowing exactly where I was from, but not being able to remember. Anyways, she informed me that their was a moose between two chairs. Luckly, it was still there. Amazing. I had never seen a moose before, well, a real one at that. Only on Rocky and Bullwinkle. I am no wildlife photographer, and it didn't help that all I had was a 35mm, but it's still something I thought I'd share coming from Baltimore. Later in the evening, I then got a nice view from my balcony as a storm passed. 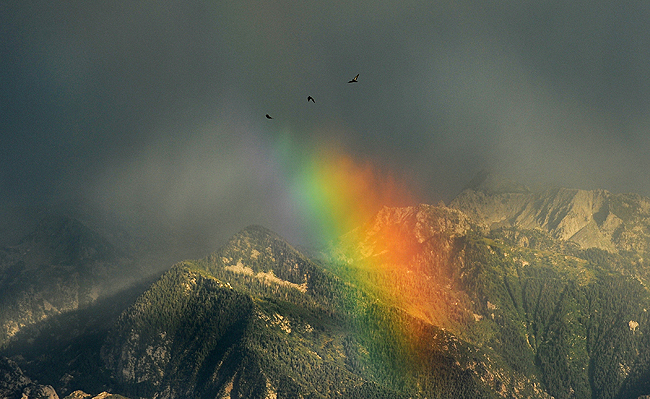 Not bad for two neat things to see: A moose and a rainbow over the mountains. Up next: The salt flats. "Cardinal and Gold water polo driver/utility player, Mike Brown, hopes to help lead his team to back-to-back championships when they compete in the National State Championships at the Naval Academy later this month. The team won the championship last season." I find it ironic that my last week as a freelancer in Baltimore, I spent every day shooting assignments that were based around one thing: Water. I say it's ironic because I am now landlocked in Utah. Granted I have a sweet pool at my new apartment complex, and there are two big bodies of water near me, too. I can no longer drive a couple hours and be at the beach. I am no longer living in a city known for its inner harbor. This assignment was a late one. What I mean is that it came to me late in the day with not much time to prepare. Years ago, I attempted my first underwater portrait. I used my friend Kanji's fish tank aquarium, with a custom built ball-head on a piece of wood. To say it was sub-par was an under statement. It was a horrific portrait. This time, I went back to Kanji for his fish tank. I knew I had to change my ways for this one. I lit this portrait, and I cranked the tank as far as I could go before flooding the camera. Obviously, I protected the camera with saran wrap and towels. Thanks to a great portrait subject, who was literally put through a workout, it took only one frame to get it right. Well, almost. The left hand being cutoff at the bottom of the frame is bothersome to me, but can't get everything perfect every time. 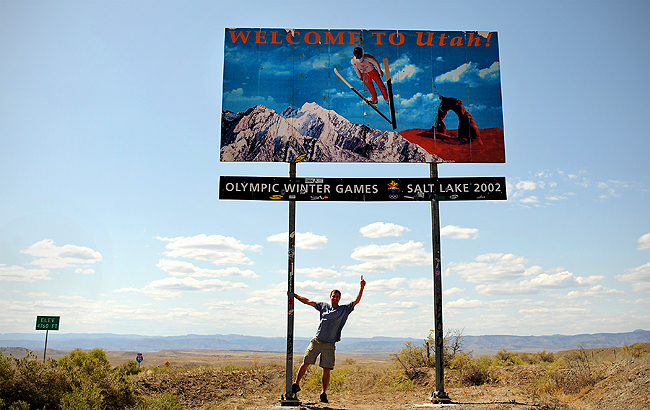 "Patrick Smith poses with the Utah border sign off of I-70, Saturday, Aug.8, 2009." After driving for more than 33 hours, I made it to Utah. I’m really, really excited to meet everyone at my new job, other photographers in the area, and get started. I officially start Aug.17, but the next three days I am searching non-stop for a place to live. Yep, I drove all the way here without a place lined up to live. Yikes! So if you have any suggestions (actual apartments/condos) drop me an e-mail or call. Anyways, Utah is gorgeous! The light is beautiful. And NOTHING like dangerous, murder-filled Baltimore! As for the new car, it's still in one piece. 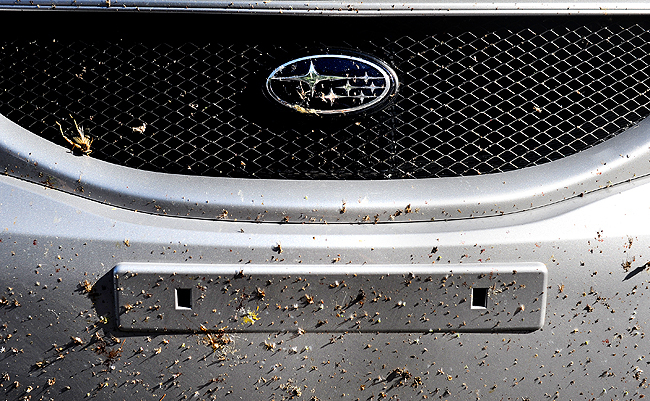 Front bumper of the new car got thrashed with bugs. I also have four huge, fingernail deep scratches in my front windshield. They are bad, not sure how they got there. Can glass be buffed? 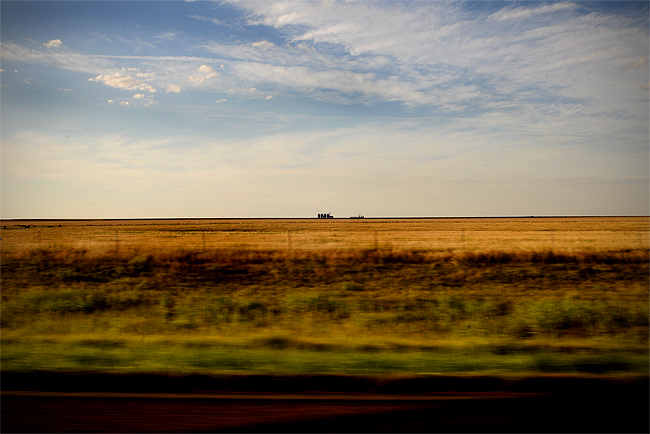 "A farm can be seen in the far distance somewhere in middle America, Kansas." What? You've never driven on I-70 through Kansas? Well, let me personally tell you it's full of over stimulating things to look at. OK, not really. It was a real drag, at least on I-70 West. It averaged 100 degrees, is very windy and full of a whole lot of nothing to look at. I'm glad to be in Denver right now. Only a couple more hours til Salt Lake City. "Paying respect to the murdered Jews of Europe, a passerby strolls through Germany's central Holocaust Memorial in Berlin, Germany, June 19, 2009." With getting ready to move to Utah I haven't really been through my entire take of Europe images from June yet. They are merely sitting on a hard drive and a couple DVDs in my pile of "stuff" to move with me. With that said, I don't have much time to elaborate on my time over there. Then again, what is there to say? Food, beer and time I had over there was awesome. Instead of boring you with words, here is a little series from the trip I call "Unidentifiable Europa." These were images I made throughout Germany, The Netherlands, Belgium, and Austria. Some may be repeats from the blog before.